I don’t think any of the original Surrealists ever got to see this, but I suspect that they would have loved it. A man stands in front of a huge horn, a stool behind him unused. He plays a slow, repetitive piece on the violin. Two men without jackets hold one another and dance in circles to the music. At the end, another man, looking sort of like a sailor, comes into view, looking like he plans to take the stool, and then the picture cuts off. 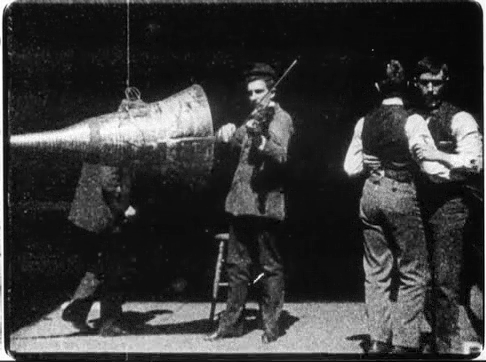 None of this was intended to produce the weird effect that it has; it was simply an early attempt to make a film with sound, one that didn’t work out well, because lining up the phonograph to play at the same speed as the film never quite worked. The dancing men are most probably there because it was felt that more movement was needed, and because there weren’t any women at Edison Studios at the time. Despite that, this movie has gained the nickname “The Gay Brothers” among modern viewers, who of course read contemporary agendas into unfamiliar images. It was almost thirty years until synchronized sound became a reality, once again changing film history forever.